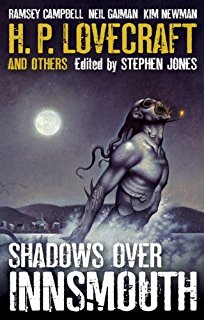 The story so far: August Derleth’s original Tales of the Cthulhu Mythos anthology (revised later by Jim Turner) proved a hard act to follow for Arkham House, with their first attempt at a followup – New Tales of the Cthulhu Mythos, edited by Ramsey Campbell – being a bit of a mixed bag. This 1995 release was one of Jim Turner’s last projects with Arkham House, before creative differences between him and April Derleth (daughter of August Derleth and co-owner of Arkham House) led to his departure. As with his revision of Tales of the Cthulhu Mythos, it has Turner banging the drum against unimaginative pastiche and pushing his very personal aesthetic take on the Mythos. 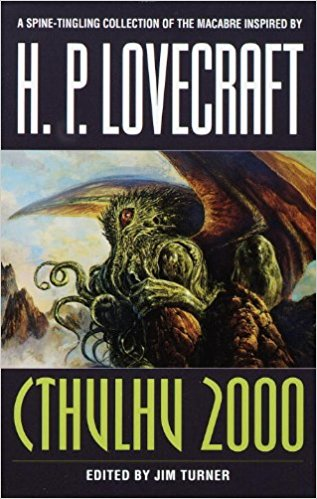 In his introduction he asserts, as he did in his introduction to Tales, that the overall trajectory of Lovecraft’s writing was more SFnal than horror-based. This time around he gives a slightly more convincing argument by more directly discussing Lovecraft’s cosmicism, though I disagree with his assertion that horror intrinsically requires a malevolent universe – the implications of an indifferent universe are horrifying in and of themselves to anyone who appreciates how small, insignificant, and precarious our place in it is. This anthology has been more extensively reprinted in recent years than New Tales, and it feels like it’s intended as a replacement for it. For one thing, it reprints the absolutely essential stories from there – Black Man With a Horn, Shaft Number 247, and The Faces At Pine Dunes. For another, whilst Turner’s revised take on Tales of the Cthulhu Mythos covered stories ranging from Lovecraft’s time to the 1970s, aside from a single Joanna Russ story from 1964 Cthulhu 2000’s stories all saw first publication in the time span from 1980 to 1993, so it does feel Turner’s attempt to present the hottest stuff that came out after the cut-off from his revised take on Tales. Series of novels – especially in fantasy and SF, but distressingly frequently on other genres as well – have a nasty tendency to turn sour partway through. The Reading Canary is your guide to precisely how far into a particular sequence you should read, and which side-passages you should explore, before the noxious gases become too much and you should turn back. As I’ve mentioned in previous reviews of early Warhammer tie-in novels, many of the first series produced by Games Workshop Books were written by fairly successful SF, fantasy and horror authors under pseudonyms. Kim Newman comes from a horror background, and is known for novels such as Anno Dracula, a peerfic of Dracula depicting a world where Van Helsing’s posse failed to drive Dracula out of England, and the Count ends up ruling the country. 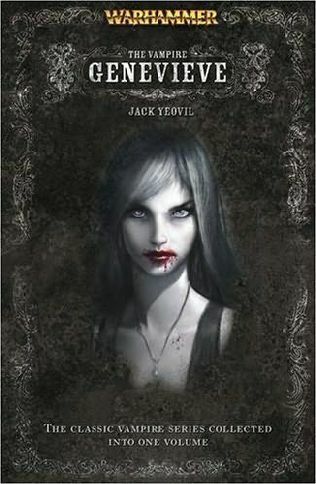 It’s not surprising, then, that the stories he wrote for Games Workshop under his Jack Yeovil pseudonym emphasise the more horrific aspects of the Warhammer world, as evidenced by the presence of Genevieve Dieudonne, a centuries-old vampire who does her utmost to resist the baser instincts of her kind and appears in many of the Yeovil tales – enough that Games Workshop and the Black Library have consistently presented her as the main protagonist of the Yeovil stories, even though that’s really not the case. But while the stories that she’s the mascot for are widely-praised by those who follow Warhammer tie-ins, can Genevieve offer anything to outsiders? The spoiler-free answer is “Yes, but only about half the time”; for the detailed answer, read on. The Mammoth Book of Best New Horror: Wait, There’s Good New Horror? Almost since the birth of Ferretbrain I have walked its nighttime corridors like a phantom, rattling my chains and bewailing the damnation of the horror genre. How, I asked myself, is anyone supposed to find the jewels from the dross any more, in the absence of a “Horror Masterworks” series? Well, perhaps I have been looking in the wrong places. Surely one of the major annual horror anthology series will be able to point me in the right direction? I mean, it’s edited by Stephen Jones, who I dislike chiefly for his poor handling of several Fantasy Masterworks compilations, but can it succeed despite him? I certainly hope so. Having found the two latest volumes in Oxfam, at a price I couldn’t well refuse, I snatched them up eagerly. Maybe this will be the roadmap I am looking for!